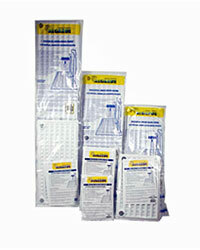 An under-gravel filter for tropical, marine or coldwater aquaria. The unique design ensures maximum area filtration, while the sealed edge prevents gravel from entering the sub-gravel area. The large diameter air-lift, which can be fitted either end, can be removed for easy cleaning without disturbing the base plate, and the filter does not require filter wool on top. Made in several sizes, which, when used singly or in multiples will fit the standard range of aquaria. For non-standard sizes they can be cut and overlapped to fit. Can be used with power heads.